c = he or his family are in contact: contact information is held by one or more of the survivors and the editor. At present the register is by service. There may be errors in the transcription of the names. The helpers and organisers associated with Sherwood are very welcome to be included in the Register. Oliver Clutton-Brock for access to his Freteval lists in 2008, now used following publication of his excellent book (RAF Evaders -The comprehensive story of thousands of escapers and their escape lines, Western Europe, 1940-45: Grub Street 2009) has been published. The WWII Escape & Evasion website has another excellent listing. 75 Sqn Lancaster III NE148 AA-H: t/o 2155 Mepal, op Stuttgart. Aircraft was badly shot up shortly after crossing the Rhine on the outbound journey later crashing when half-way across France trying to make for England, at Yevres in the Department of Eure-et-Loire, 2km E of Brou. Morris was aboard as '2nd dicky pilot' (RAF slang for along for the experience, usually before commencing ops with his own crew). The Pilot and Rear Gunner were killed and are buried in Yevres Communal Cemetery. Six of the eight aboard were New Zealanders. All the survivors evaded. Morris's evasion debriefing report reference is WO208/3321 SPG2090. F/O Morris was shot down again on 3 Feb 45, with 15 Sqn from Mildenhall, during an op to Dortmund, this time becoming a PoW in Camp 13D Nürnberg. (Lancaster I PD419 LS-V). 7 Sqn Lancaster III ND901 MG-B: t/o 2245 on the night of 1/2 May 1944 Oakington, tasked to destroy the key railway and stores depot at Chambly, north of Paris. Crashed at Nointel in the Department of Seine-et-Oise, 38km NE of Versailles. The rest of the crew, including two other New Zealanders, were killed and lie in Nointel Communal Cemetery. He returned to England 14 weeks later. His evasion debriefing report reference is WO208/3321 S/PG 2132. 420 Sqn Tholthorpe: Halifax III LW674 PT-E: t/o 2203 Op: Versailles, to bomb rail facilities. Crashed at Theuville (Eure et Loire) 15km SSE of Chartres and just to the W of the main road between Chartres and Orleans: 6k 2e: The pilot P/O L Holowaychuk was flying as P/O Holway or Holoway RCAF: He and the other 5 who were kia are buried in Theuville Communal Cemetery. F/S Bert E Brakes also evaded but has so far not been listed as at Freteval - see 1945 reunion - Norman Binnie d1991 - c.
429 (Bison) Squadron Leeming: LV973 AL-X: t/o 2228 to bomb marshalling yards at Versailles 10-11 June 1944. Crashed at Friaize (Eure et Loir), 9 km WSW of Courville-sur-Eure. Pilot F/L A MacDonald buried at Friaize, rest of crew evaded - see also Harry Guild, and TB Chapman and possibly McCarthy. CHAPMAN, Thomas B Bert - Nova Scotia, Canada. 429 (Bison) Squadron Leeming: LV973 AL-X: t/o 2228 to bomb marshalling yards at Versailles 10-11 June 1944. Crashed at Friaize (Eure et Loir), 9 km WSW of Courville-sur-Eure. Pilot F/L A MacDonald buried at Friaize, rest of crew evaded. [Robert Chapman, grandson 22/05/08: Bert recalled the a/c being attacked simultaneously by two Ju88. ] see also front of banknote 2 and Harry Guild, and JR Calderbank etc. Dunseith, S F/Sgt RCAF R/191859 300 Sqn Air Gunner(R) 24 July 1944: Lancaster I LM178 BH-U Op Stuttgart: t/o 2137 Faldingworth: shot down by a night fighter and crashed just to the N of St Laurent des Bois (Loir-et-Cher), 5km NE of the small town of Marchenoir. 4 of crew kia, 2 other evaded. All evaders wounded, Dunseith went to hospital in Le Mans. See also Forman, CM. GREENBURGH, Lou - Winnipeg, Canada. Also listed by Greenburgh! 429 (Bison) Squadron Leeming: LV973 AL-X: t/o 2228 to bomb marshalling yards at Versailles 10-11 June 1944. Crashed at Friaize (Eure et Loir), 9 km WSW of Courville-sur-Eure. Pilot F/L A MacDonald buried at Friaize, rest of crew evaded - see also TB Chapman, JR Calderbank and H Guild. 429 (Bison) Squadron Leeming: LV973 AL-X: t/o 2228 to bomb marshalling yards at Versailles 10-11 June 1944. Crashed at Friaize (Eure et Loir), 9 km WSW of Courville-sur-Eure. Pilot F/L A MacDonald buried at Friaize, rest of crew evaded - see also TB Chapman and JR Calderbank. Ranks are (in seniority): Capt – Captain; 1/Lt – 1st Lieutenant; 2/Lt – 2nd Lieutenant; F. O. – Flight Officer; T/Sgt – Technical Sergeant; S/Sgt – Staff Sergeant; Sgt – Sergeant; Cpl – Corporal. Crew positions are: P – Pilot; CP – Co-pilot; N – Navigator; B – Bombardier; RO – Radio Operator; BTG – Ball turret gunner; TTG – Top turret gunner; TG – Tail gunner; LWG/RWG – Left/Right waist gunner. BOGGAN*, Thomas L - Army? DILLON, William T - Colfax, Indiana, USA - Army? ssdi : b 15 Jan 22, 5 May 91 in Pine Bluff. - Army? ssdi : b 7 Nov 1915, d 11 Jun 96 Granbury, Hood County, TX - Army? B-25H; 42-97188; 384th BG; 544th BS; 14 June 1944. JOHNSON, Joseph - West Palm Beach, Florida, USA - Army? NARA # 13083697, Blair County, PA, b 1921, enlisted in Air Corps. NARA (Edward "E.") # 36296987, Waupaca County, WI, b 1923 ? ssdi : b 19 May 23, d in Waupaca 1 Mar 01 ? - Army? NARA #18017557, Hamilton County, NE, b 1920 - Army? B-17G; 42-31380; 385th BG/548th BS: 8 February 1944. NARA #16150721, Wayne County, MI, b 1924 - Army? WISEMAN* Abraham Lt. - Army? MAC DONALD Lewis: 363FG ? Hi Frank; I have just [July 2003] spent a couple of exciting hours reading your website and thought I would provide yet another link in that long chain of 152 men. I am Lorraine Denise Vickerman, the daughter of William Kingswell Vickerman. In the Sherwood Register you will see my Dad's name - he is the last name of the 30 RCAF men in the list under VICKERMAN William K.
Dad died in 1976 when I was 21 and was predeceased by Mom in 1963, so a lot of his story remains a mystery, as he didn't talk much par of the war. I always knew my name, particularly the "Denise", was after a young woman in the Underground. I have done a lot of research in the past 2 years and have located Denise. She lives in Brussels, is about 77 now, and God-willing I will meet her when I go to Europe this fall. Dad was flying a Halifax III, called "Pistol Packin Momma", on a night bombing run to Achères France June 7th, 1944. He was the pilot and had only been with the Canadian 432 Squadron for less than a month. They were attacked by a Ju 88, and six of the crew made it out of the plane safely. Sgt.Frederick Layton was his rear-gunner and died that day. On the ground Dad hooked up with his mid-upper gunner, also on your Sherwood Register, Sgt. Noé BEAUCHESNE. He and Noé stayed together for that 10 weeks, being hidden by one family, then the next, till they ended up at Freteval Forest. When Dad got back to Britain on August 18th, 1944, he did not return to the fighting. He had burned his arm and, I presume had some time off, so headed home to Canada. He and my Mom married in October 1944 with Noé standing beside him as his Best Man. They never did stay in touch with each other. Using Archives info, I was able to locate Noé's family. He died in 1989, but I have made a wonderful new friend in his widow, Rita Beauchesne. Noé was from Ottawa. I live in Richmond, which is a suburb of Vancouver B.C., Canada. My understanding is that Dad and Noé were shot down near Sérifontaine. After 2 days of hiding during daylight hours and running at night, they approached a farmer who took them in and fed them. They were then transferred to a helper from the nearby town, who took them to Neuville, then Argenteuil, where they picked up another travelling companion who was a Belgian woman. She took them to Paris, and they left the next day on a southbound train. At one point they apparently sat across from a couple of Germans which must have been an horrific experience. They disembarked at Etampes, walked to Augerville, where they were handed over to two Frenchmen. They were then guided, by stages, to Voyes, and finally the camp at Freteval. Noé was French Canadian so I'm sure his French language helped them along. It is an amazing feat that the Underground were able to pass them through so many hands to get them to Freteval. It sounds like many, many people were involved. Of Dad's four remaining crew members, two made it back to Britain and two were taken as POW's till the end of the war. Although he survived the war, F/O Hoffman only lived till 1953. I have recently met his only daughter, Donna Gatley, who happens to live 10 minutes away from me in the little town of Ladner. He died when Donna was only 6 years old. (Radio Operator: B-17G 42-31565: cr 4 Mar 1944 Saint-Symphorien, Belgium) wrote 15 July 2004 - "When I arrived with Jonathan Pearson, our navigator, at Philippe and Virginia d'Albert Lake's apartment in Paris on June 3, 1944, seated in easy chairs were Bill Brayley (Canadian), Denny Peppall (from Yorkshire) and Peter Berry (from Piccadilly). On June 5, 1944 we were taken to the railroad station in Paris and then on to Chateaudun, escorted by teenage boys for about 7 miles to the barn at the Rideau's house. 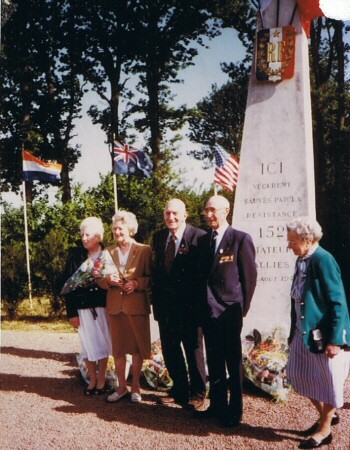 The next morning we were taken to the [Fréteval] Forest, which was June 6, 1944." RAFES: thanks to Oliver Clutton-Brock we now know that Laurie Boness, who was an active member of RAFES, did not enter Fréteval but was was hidden in the villages of Boubers-sur-Canche, Fillièvres, and Monchel-sur-Canche (all Pas-de-Calais). He believed that the flak burst that had hit LM597 had set No. 1 starboard fuel tank on fire. Overcome by fumes as he left the aircraft he came to his senses as he floated to earth coned by two searchlights, but was not aware of anyone shooting at him. After walking as far as he could that night, he ‘went into hiding for forty eight hours.’ He ‘then went to a farm house at the village of Boubers where they gave me food and clothes. I eventually met a schoolmistress who put me into the hands of the French Army of Resistance at the village of Fillevres [sic], but I was later moved to the village of Monchel.’ Here he was looked after by Mesdames Ernestine Sainsolieux and Hermance Turpin, and by Camille and Raymonde Soualle, until liberated by British forces on 4 September.